Elvis’ alien clone better move over. What is one to make of this? 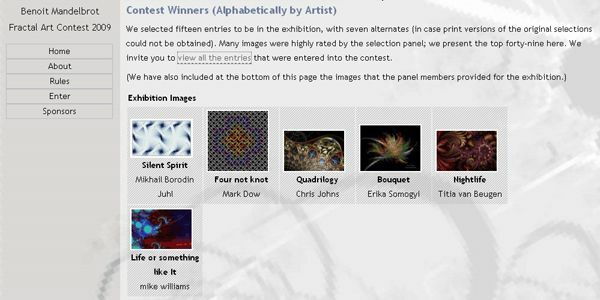 Just by accident, OT wandered into the “winners” page of the current (and ongoing) 2009 Benoit Mandelbrot Fractal Art Contest and found it active and showing thumbnails of entries listed as exhibition winners, alternates, and honorable mentions. You can see for yourself here — or you will be able to for as long as this link lasts — which, I predict, won’t be very long. So, before you can shout out “you lie” from the peanut gallery, here are some screencaps taken on Wednesday, September 23rd. 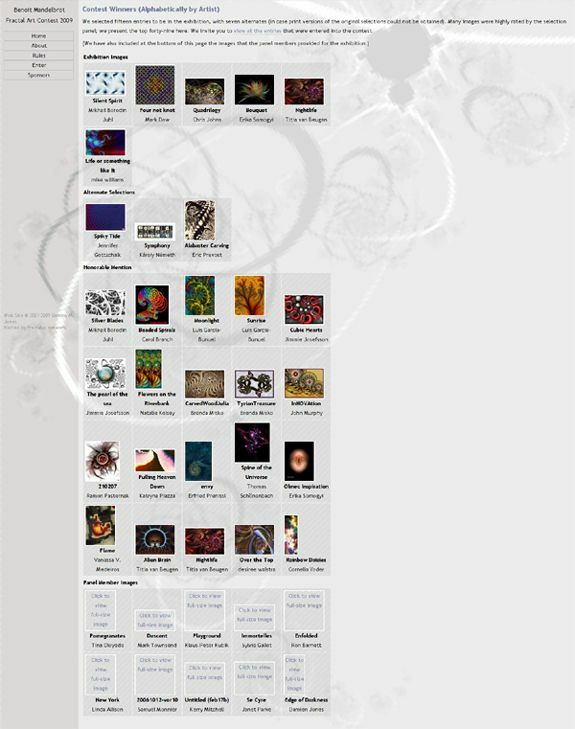 Click on the full-page image below to open a larger and more readable view in a new window. Isn’t October 10th the deadline for the competition? 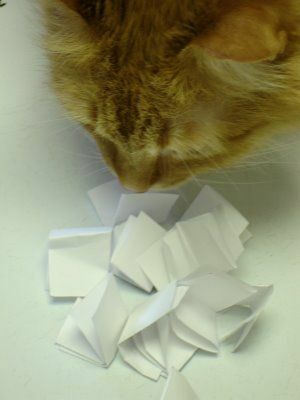 So, are winners and runners-up being selected before all submissions have arrived and been critiqued by the judging panel? It certainly seems so. Moreover, are certain entries being given some kind of preferential treatment — that is, has their placement in the competition already been pre-determined before all contest entries have even come in? 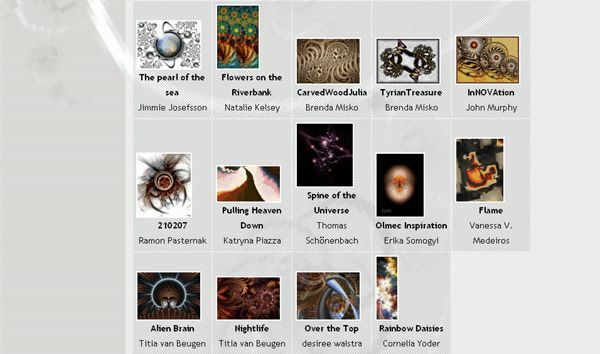 After all, how can one “win” an art competition before the complete field of entries has been seen and reviewed? Obviously, this page mirrors the 2007 winner’s page. Is this an under construction page that adds selected winners and runners-up as the contest progresses? 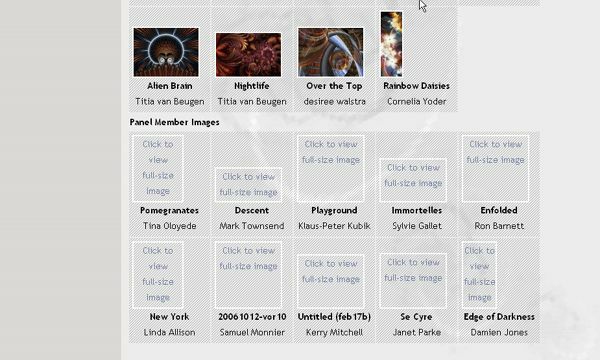 If so, has the entire judging panel fully reviewed and ranked these entries — or are these entries being placed on the site solely by the director who, presumably, is the only person with access privileges to change and update this particular page? Why is this page “live” before the competition has even closed — especially if a forthcoming explanation (assuming the normally secretive director even bothers to provide one) is that what we are all seeing is merely some kind of practice template trial run kind of deal? If that is so, can we then assume that the artists listed as winners, alts, and HMs are not necessarily going to be receiving such accolades after the competition deadline of October 10th? 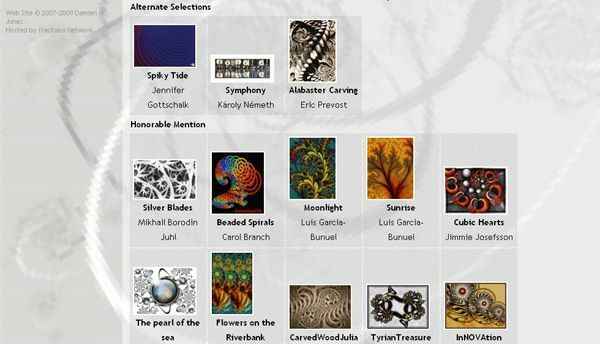 Bottom line: Have these artists actually won or placed in the 2009 BMFAC or not? And how is such a situation possible when the judging panel has yet to even view all of the competition’s entries?